Halifax II LW270 crashed near Hjelm on the island of Lolland 23/4 1944. The aircraft belonged to RAF 77 Sqn Bomber Command and was coded KN-P.
T/o 21:05 Elvington. OP: Gardening the Baltic Sea off the port of Rostock. When close to the island of Lolland LW270 was attacked by a Bf 110 night fighter belived to be of 8./NJG 3 and piloted by Oberleutnant Fritz Brinkmann. The first attack was not succesfull but during the second attack the left wing of the Halifax started burning. At the same time bullets passed thrugh the fuselage and it was believed by the survivors that Mid upper gunner Sgt William H. Loverock was wounded by those. 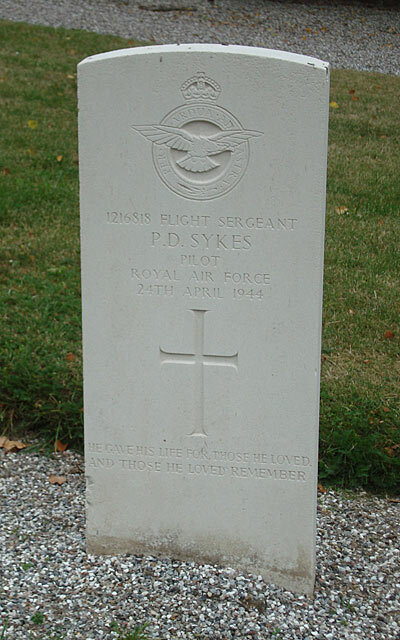 The evasive action had turned the aircraft out to sea and Pilot F/S Paul D.Sykes turned the aircraft towards land again and ordered the crew to bail out when over land. The first to leave was Navigator F/O James H. Murray who drifted out to sea and landed in the water one or two kilometres off Bandholm. He inflated his Mae West and swam to the shore. He entered a farm house in Blans west of Bandholm and lay down to sleep on the floor in front of the fire place. When the lady of the house found him in the morning he was send off to bed. The next day he was passed on to Maribo where he met with his comrades. Next to leave was Bomb Aimer Sgt Frank Haynes who landed in a field belonging to “Kristinebjerg” farm three kilometres northwest of Nykøbing Falster on the island of Falster. He somehow managed to make it to Sweden within a few days. W/Op F/Sgt Paddy W.A. Powers landed on a beach and quickly made contact to a Dane who told him to hide in a haystack. After darkness the Dane returned bringing beer and food. The next night Powers was taken to the house of Doctor Hansen where he met with Murray. Later in the evening Harrison arrived. Rear Gunner John J. Harrison landed in a field belived to be in Reersnæs on the island of Lolland and hid his chute. He then walked by night and hid during the day. When trying to steal a boat in Bandholm harbour he suddently faced Skipper Christensen who from then on helped him. After a few days Doctor Ib Hansen of Maribo showed up to check Murrays story. It was satisfactuary and he was taken to Maribo where he met with Murray and Power. The next morning the three flyers were taken to the railway station by two resistance agents. 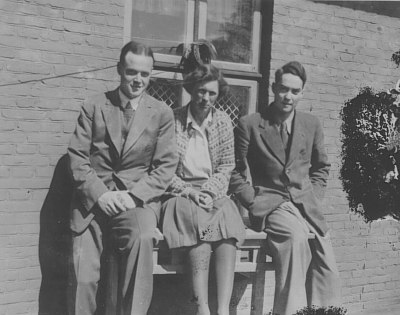 They reached København where they were hidden until they could be sailed to Sweden where they arrived on 29/4 1944. Flt. Engr. 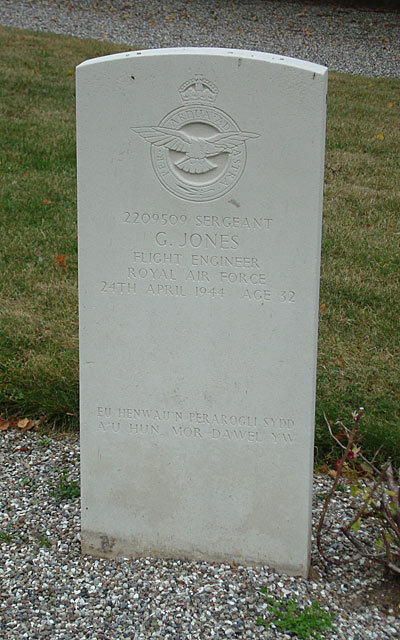 Sgt Glyn Jones did not have any luck as his parachute did not deploy and he fell to his dead. At noon on 24/4 his body was found in a gravel pit near Sørup on the island of Lolland. He was laid to rest in Svinø cemetery on 30/4 1944. Pilot F/S Paul D. Sykes landed in the waters of Guldborgsund and freed himself of his parachute. Apparently he then froze to death before he could reach land. His dead body was found kept afloat by his Mae West in Guldborgsund at Hervigen at 19:00 hours on 24/4 and taken to the morgue at the hospital in Nykøbing Falster. He was laid to rest in Svinø cemetery on 30/4 1944. His parachute was found in Guldborgsund near the bridge between Nykøbing Falster and Lolland on 25/4. 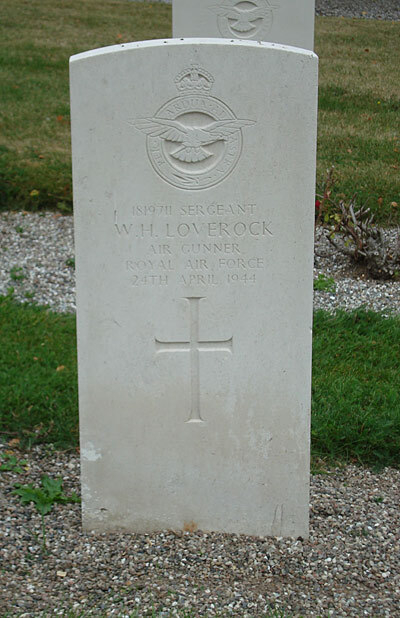 The body of Sgt Loverock was found at Hunseby Strandvej road near Bandholm on the island of Lolland on 23/5 and was laid to rest in Svinø cemetery on 25/5 1944. The aircraft crashed in a field belonging to Farmer Markusen, Hjelm damaging the farm severely. Sources: LBUK, DFEV, BS, AS 19-280, “Night Flight” by G.J ones, Horsens Folkeblad, Power family.